The Guilt Trip #Target Exclusive Wrapped Blu-ray #Giveaway! I'm so excited about this giveaway for all of our readers. The giveaway is open to both US and Canada Residents. This movie comes specially wrapped with a special card/message from Barbara. The special wrapped blu-ray/DVD set is only exclusive at Target. This movie is simply hilarious and a perfect movie to watch or give as a gift for this up and coming Mother's Day. Please be sure to check back on the blog for our review! Screen legend Barbra Streisand and comic master Seth Rogen “are the perfect comedy duo” (Shawn Edwards, Fox-TV) in director Anne Fletcher’s (The Proposal) delightful and heartwarming comedy that is “packed with laugh-out-loud moments” (Meriah Doty, Yahoo! Movies). As inventor Andy Brewster (Rogen) is about to embark on a road trip to sell his latest product, he feels compelled to invite his mother, Joyce (Streisand), along for the ride. Across 3,000 miles of adventure and antics both Andy and Joyce discover that while they have their differences, they also have more in common than they ever realized. 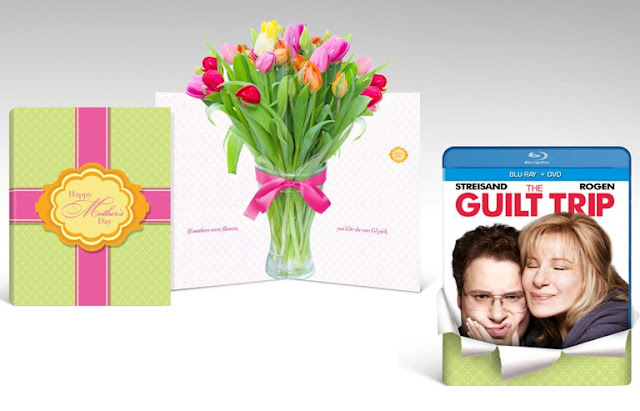 An ideal gift to share with your mom on Mother’s Day, The Guilt Trip will be available in a Blu-ray/DVD combo pack with UltraViolet™. The two-disc set comes packed with over an hour of hilarious bonus features including featurettes on Barbra and Seth, a look inside Barbra’s world, an alternate opening and ending, over 10 deleted scenes and an uproarious gag reel. The film will also be available as a single-disc DVD.